The racist England FA are withholding some of the £80,000 owed to Eni Aluko under their confidentiality agreement. 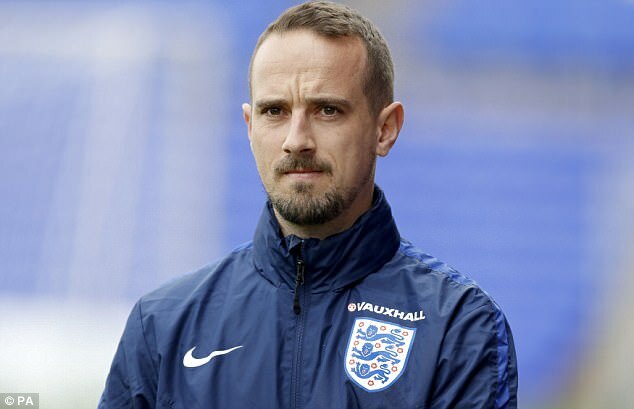 Aluko was paid to keep quiet after she made allegations of bullying, harassment and racism against former England women’s manager Mark Sampson. But only 24 hours after Sampson was sacked for having inappropriate relationships with players in a previous job, Sportsmail has learned that payments due to Aluko have been stopped, raising further concerns about the FA hierarchy. 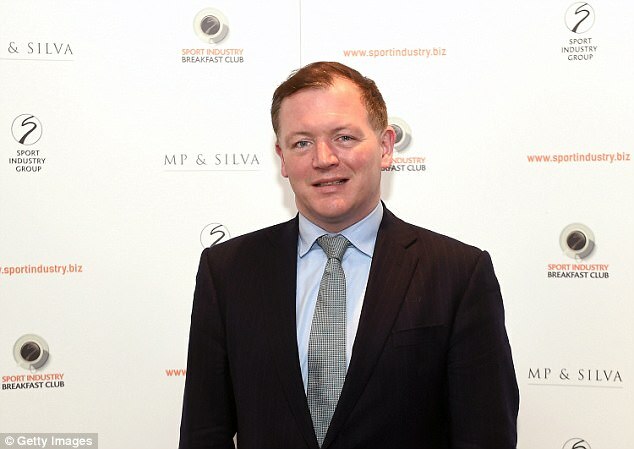 MP Damian Collins accused the FA of an ‘inexcusable’ lack of leadership on Thursday. Sportsmail revealed last month that a financial settlement had been agreed between the FA and Aluko essentially to buy her silence, despite two investigations into claims made by the 102-cap striker apparently clearing Sampson of any wrongdoing. 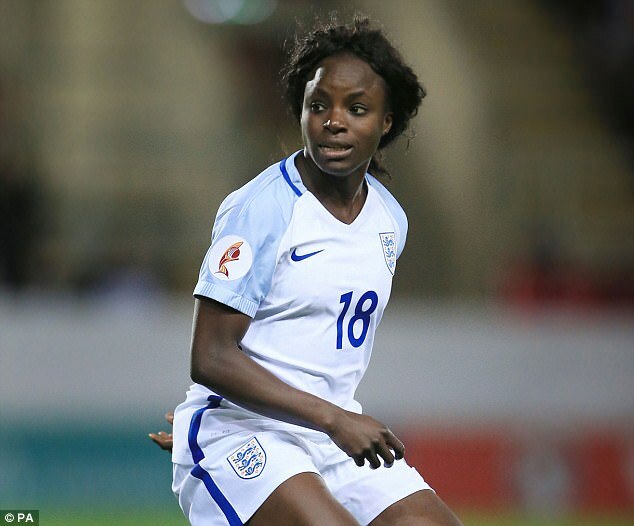 The FA maintain that the payment was to avoid disruption to the build-up to the European Championship in the summer, and Aluko responded to the original Sportsmail story by meeting FA officials and requesting permission to speak publicly about the facts of her case. However, what she subsequently said in a series of interviews now appears to be central to ongoing discussions between the governing body and Aluko’s lawyers, and the money is being withheld as a result. On Thursday night both the FA and Aluko declined to comment. The FA say the decision to sack Sampson was not influenced by Aluko’s case, with chief executive Martin Glenn admitting it was prompted by the details of an investigation of which he was made aware two years ago. On Thursday Glenn was dealing with the fallout from that, though senior FA sources were privately insisting he retains the support of the Wembley board. Matters are set to worsen on Friday with Drew Spence — the central figure in the original Aluko racism allegations that were emailed to the FA in May 2016 — due to meet barrister Katharine Newton to corroborate the story before releasing a statement that is expected to support her Chelsea and former England colleague. 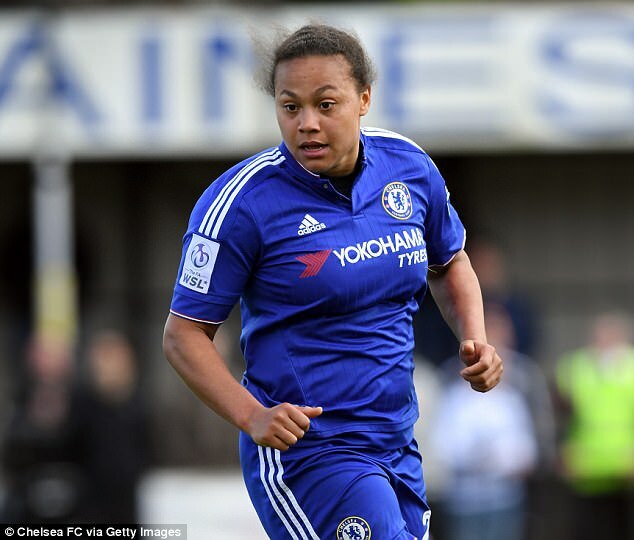 Aluko claimed that during a meeting at the 2015 China Cup, Sampson asked Spence, who is mixed race, how many times she had been arrested. Sampson has repeatedly denied the accusations and the FA have consistently said that no evidence has been found to support Aluko’s claims. But Newton, who led the second investigation, never interviewed Spence, who only stepped forward to complain last week. That prompted the barrister’s investigation to reopen. 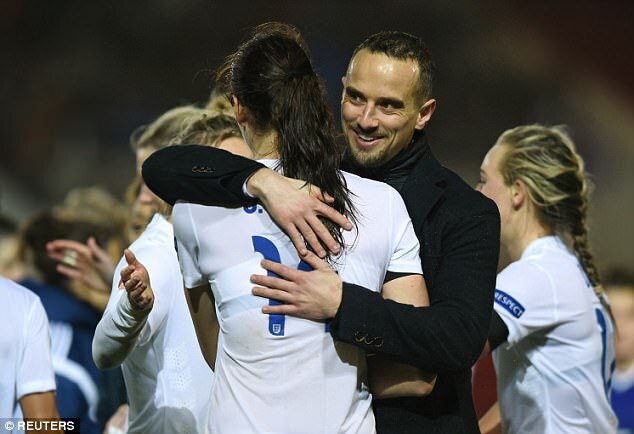 August 6: Sportsmail reveals that the Football Association paid hush money to Eni Aluko to keep quiet over an investigation into her claims of racism and bullying against Mark Sampson. August 8: Aluko speaks out and says she was silenced after making her claims. August 18: Sampson says he needs to communicate better after FA release summery of report into Aluko’s allegations. August 21: Aluko claims Sampson once told her to make sure her Nigerian relatives did not bring Ebola to a match at Wembley. August 23: Lianne Sanderson accuses Sampson and the FA of creating a culture of fear by axing players who dare to raise issues. August 25: England boss Gareth Southgate gives his backing to Sampson. August 25: Drew Spence is revealed as the player involved in Aluko’s allegations about a comment made at the 2015 China Cup. August 30: Aluko says she is ’embarrassed and ashamed to be a participant of women’s football in this country’ after accusing FA of endorsing racism. September 5: Sampson rejects Aluko’s allegations in his first TV interview since the claims were revealed by Sportsmail. September 8: England midfielder Katie Chapman claims she was dropped after telling Sampson about her divorce. September 11: FA officials will face grilling by MPs over the situation, it is announced. September 14: It emerges that the FA could re-open their investigation after Spence writes to officials, corroborating Aluko’s claim. 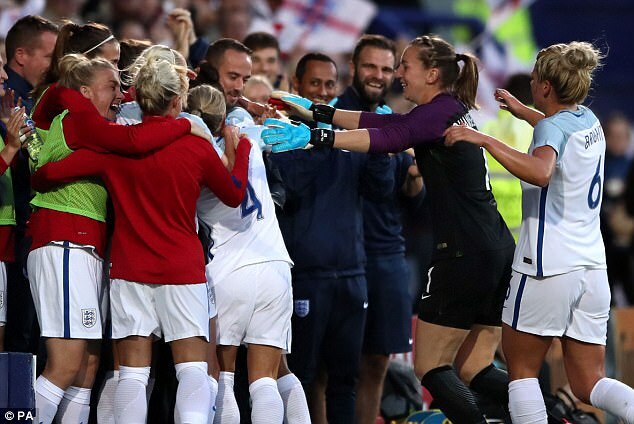 September 16: It is revealed that Alex Scott was not interviewed during investigation into the allegations. September 20: Sampson leaves his role. The circumstances of Newton’s appointment led to another PR gaffe on Thursday, with Glenn contradicting the FA’s own lawyers. He told The Guardian he specifically chose a black woman to investigate the racism allegations against Sampson. Yet the FA’s solicitors, Farrer & Co, wrote to the newspaper in August to say the suggestion Newton had been chosen because of her skin colour was ‘plainly false and categorically rejected’. The process by which the FA appointed Sampson in December 2013 also came under further scrutiny amid claims that the FA were made aware of issues concerning him during his time at Bristol Academy. He was dismissed this week for ‘inappropriate and unacceptable behaviour’ that emerged in a year-long investigation conducted in 2014 and 2015, and the lobby group Women In Football suggested the FA were made aware of concerns about Sampson while he was being considered. ‘[We] understand that questions over Sampson’s suitability for the role were flagged to the FA as early as 2013 during the recruitment process,’ they said. ‘The safeguarding investigation of 2014, Sampson being sent on an education course in 2015, Eni Aluko’s complaint in 2016 and Dame Tanni Grey-Thompson’s duty of care report in April 2017 were all missed opportunities for the governing body to more closely examine the issues. 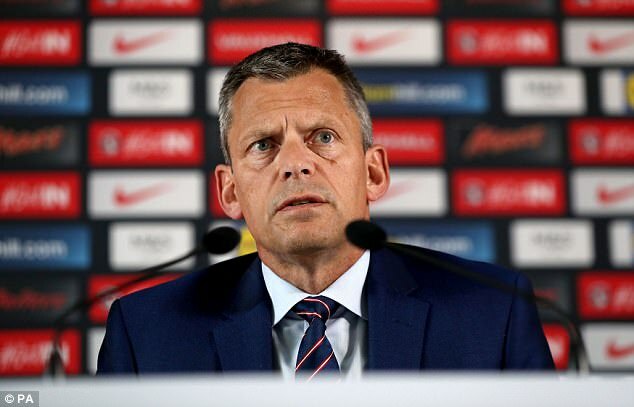 The FA insist nobody still working at the governing body is aware of staff being given some kind of warning about Sampson during the recruitment process. Collins, MP for Folkestone and Hythe and chairman of the Digital, Culture, Media and Sport committee that will examine the Sampson case next month, told Sky News Sampson should never have been appointed in the first place, and that action should have been taken a long time ago. Aluko has only said publicly that she believes team selections were made on the basis of ‘popularity’ rather than form. But in her eight-page complaint she detailed two years of ‘bullying and harassment’, claiming her treatment had forced her to quit. In her submission, seen by the Daily Mail, she gave seven specific accounts in what is described as a ‘non-exhaustive’ list. She also claimed ‘other England players, past and present’ had suffered ‘negative personal experiences’. The striker said unfavourable treatment from FA staff began in February 2014, a month after Sampson was appointed head coach. She said that in video analysis from one match, a coach on the touchline says: ‘Her [Aluko’s] fitness results are good,’ to which another one replies: ‘Yeah but she is lazy as f***.’ Both were wearing microphones. In another instance, the complaint said a coach could be heard saying: ‘F*** off Eni’ after she lost possession. The replay analysis is said to have been available to all players. In the complaint Aluko added: ‘It is inevitable that such damaging behaviour… has influenced… staff and teammates to be empowered to also attempt to undermine and belittle. I submit that this is the basis of a culture of bullying and harassment. He also described the situation as ‘incredibly serious’ and said Glenn’s failure to ask about the contents of the report in October 2015 revealed an ‘absence of leadership’. 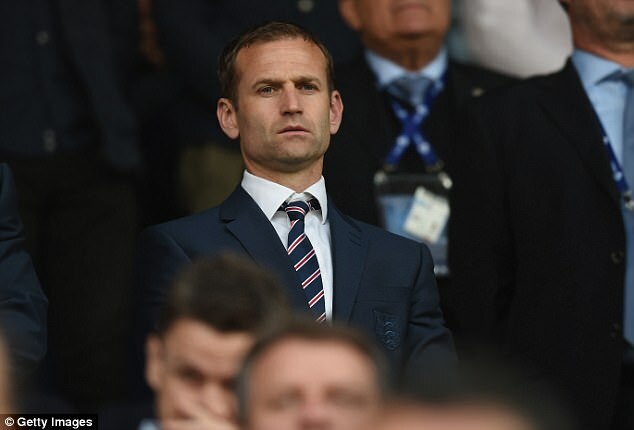 Boardroom sources might insist support remains for Glenn and technical director Dan Ashworth but on Friday night the focus on them continued to intensify, with one insider raising concerns about Ashworth’s ‘non-accountability’. Efforts were made at Wembley on Wednesday to distance Ashworth from the Sampson fiasco, with Sir Trevor Brooking identified as the man responsible for the appointment. Brooking no longer works at the FA. But Ashworth was on the assessment panel that oversaw the recruitment of Sampson and was responsible for the decision to renew his contract in January 2016, even though he had by then been the subject of an investigation.